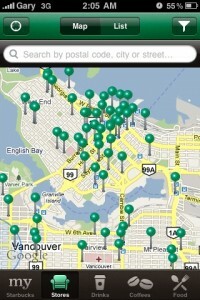 Starbucks has released an official iPhone app for Canadians. The app is called myStarbucks Canada and includes extensive information on coffee beverages, snacks, and food. 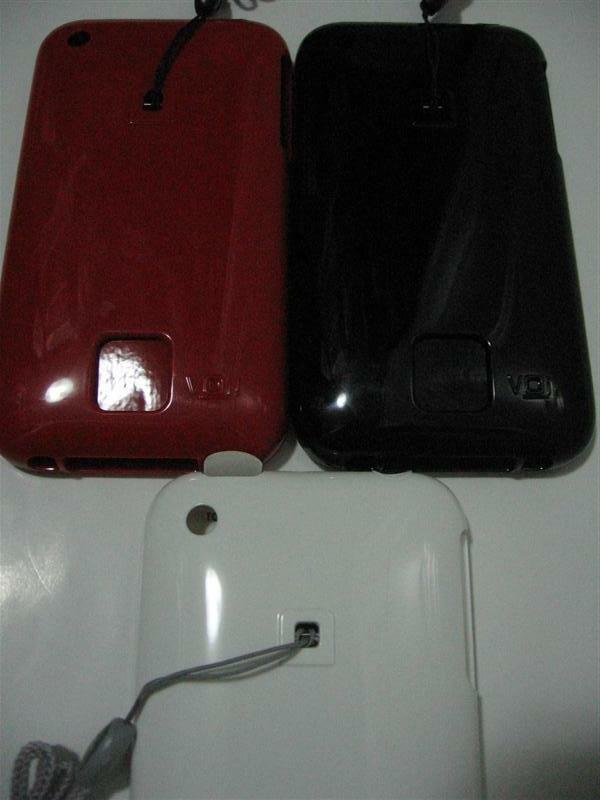 It also locates all the locations near your location and includes key info like store hours, address, phone number, etc. 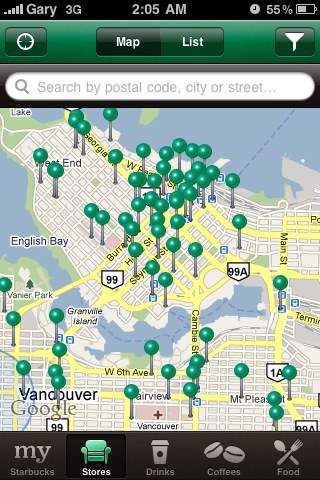 Finally the official Canadian iPhone application from Starbucks! Want to find a store thatâ€™s open, with a drive through? Now you can do that and more with myStarbucks. Explore our whole bean coffees, find delicious foods and nutrition information, and build your own perfect drinks. Want to share? You can send your drinks to friends by email, SMS, via Facebook and Twitter directly to their iPhone or iPod Â®Touch. â€¢	Store Locator: Display the closest stores, directions, store hours and amenitiesâ€”find stores with a drive through, oven warmed food and more! Share your location using Facebook and Twitter. 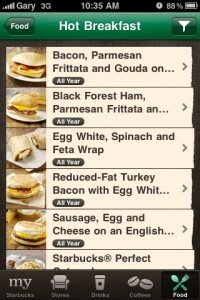 â€¢	Food Menu: Browse the menu and see detailed nutritional info and ingredients. Want to find the perfect healthy food? The calorie and allergen filter will help you find foods that meet your health and wellness needs. â€¢	Coffee Menu: Explore every Starbucks Â® whole bean coffee. Find decaf, organic and aged coffees that will entice your palette. 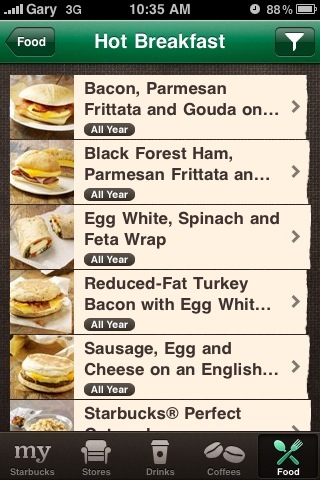 â€¢	myStarbucks: Save all of your favorites for quick recall and sharing. 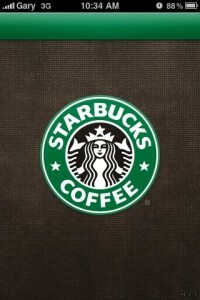 â€¢	US and UK: Ready to explore what Starbucks offers in the US and the UK? Learn more about Starbucks assortments in these locations. What I would’ve liked to have seen was the ability to check your Starbucks card balance, or even pay for purchases right from your iPhone. The app did crash a couple times on my 3GS and froze on my 3G. 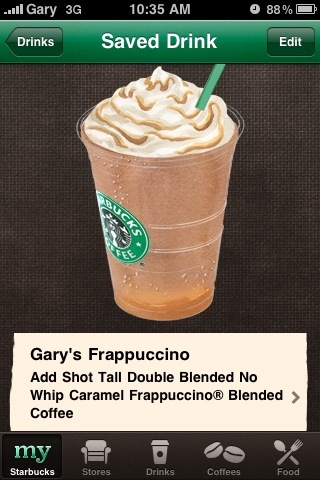 For a Starbucks lover like myself, this app is fun to use. 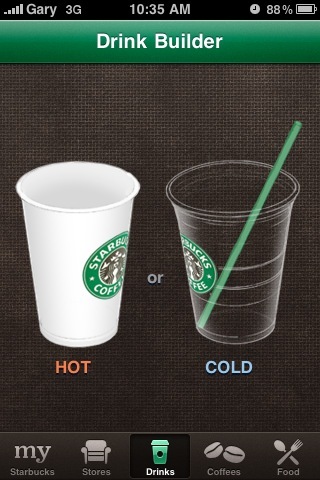 You can setup your hot/cold drinks and share them with friends. 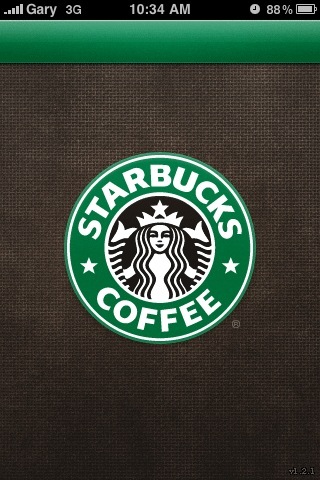 If you love Starbucks, you need this app. Click here to download!